The MHL ports of recent handsets from HTC, Samsung and others haven't gotten enough attention yet, but knowing the tech is there is still comforting. Mobile High-Definition Link (MHL) basically is the microUSB port on these phones, where you can plug a $15 MHL-to-HDMI dongle, and connect your phone to an HDTV without the need for an extra microHDMI port. Some TVs are already shipping with the MHL tech built-in, and their ports look like regular HDMI ones, but can also charge your phone while playing games or watching 1080p HD movies. 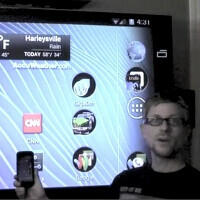 For almost any other TV you have to use the dongle, and how you do this is demonstrated on the Samsung Galaxy Nexus in the video below. Naturally, we all prefer the connection to be done without cables, but DLNA and other wireless streaming technologies we've found not to always be up to snuff with the task, especially with high-definition movies or games. They are also battery-hogs, so the good old cable is often the best solution, and the MHL output along with a cloud gaming service like OnLive can be a decent alternative to consoles on the cheap. its not a nexus phone, who cares? I just received my MHL adapter in the mail and so far i have not been able to get it to work with my Galaxy Nexus.